Since appointed executive creative director of Coach back in 2013, Yorkshire-born Stuart Vevers has been busy exploring various parts of his adopted country to expand his lifelong fascination with Americana. Who could forget his Spring/Summer ’16 show, inspired by the Terrence Malick classic, Badlands, or his grungy take on Little House on the Prairie for Autumn/Winter ’17? This season, Vevers took a short trip—24 hours, to be exact—to Santa Fe, in the foothills of the Southern Rockies, a place where Georgia O’Keeffe, too, found inspiration for her iconic paintings. According to Vevers, the collection was all about “salvaging and scavenging”; he wanted to stay true to his vision to construct a contemporary outlook of Americana through the eyes of the New Romantic. The outcome? A past-and-future collide, expressed through a post-apocalyptic-meets-Midwest collection. To begin, Vevers sent down an androgynous model in a creamy dress that featured a Victorian ruffled neckline, and teamed it with an oversized patchwork leather vest and desert boots that was part-Mad Max, part-The Road. Beyond vintage prairie dresses, floaty smock skirts, and balloon-sleeved blouses in desert hues, Vevers also showcased the versatility of denim and leather, evident through patchwork on dresses, jumpsuits, and jackets. 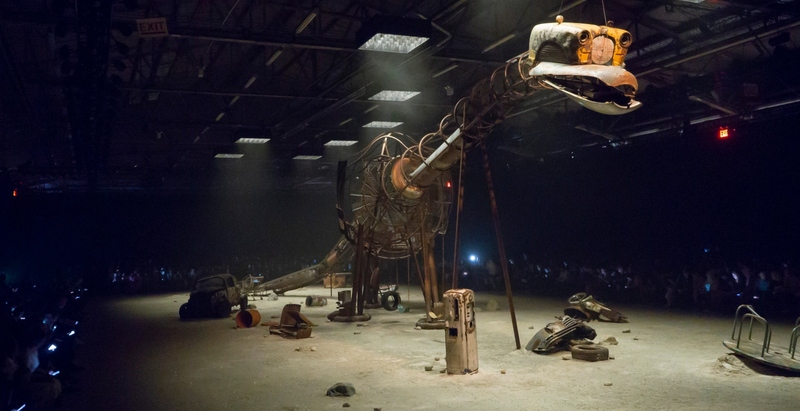 The clothes were further accentuated by an eerie dystopian set, complete with an enormous brontosaurus structure called Bronty, which was constructed from oxidised metals and placed in the middle of the gravel-and-sand strewn runway. Vevers also debuted his Disney x Coach collaboration, where childhood favourites were given dark, rebellious makeovers—think characters from Dumbo, The Aristocats, and Bambi printed on oversized hoodies, tees, and maxi skirts that gave off major ’90s grunge vibes, in the spirit of poster icons Sinéad O’Connor and Dolores O’Riordan. Leather fringes reigned supreme in all shapes and sizes, and adorned everything from cowboy-inspired outerwear and footwear to coveted bags. A stark contrast from the glitter-and-crystal-filled collection last year, Vevers’s Coach 1941 Spring/Summer ’19 offered intriguing takes on Americana that challenged the norm. One might argue that it may be his best collection for Coach to date. In the event of a zombie apocalypse, consider this dystopian dressing, to the rescue. Check out BAZAAR’s picks from the collection below.